Lancaster Bible College recently sponsored their annual Total Percussion Seminar as part of the Lancaster Summer Music program. AMT’s own drummer/percussionist extraordinaire, Gabriel Staznik , is a member of the music faculty at LBC and served as Artistic Director for the event. 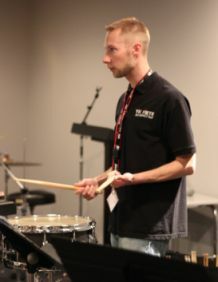 The five-day seminar, specifically designed for high school and college students, featured world-class professional percussionists offering clinics, workshops, and master classes. Students received hands-on instruction in orchestral percussion, drum set, world drumming, music technology, and audition preparation. On the last day of the seminar, participants were treated to a performance and Q&A session with members of Hershey Park’s Cocoa Rhythm Factory. For information on future events, check out Lancaster Summer Music, and visit the Total Percussion Seminar Facebook page for some great photos of the students in action. Kudos to Gabe, guest artists and clinicians, and TPS organizers on their successful event and for offering a new generation of aspiring percussionists the opportunity to learn from the best!